eBook gift cards have been tried a half-dozen times in the past ten years, including as a way to sell digital textbooks, Christian books (Zondervan), and novels (in US Target stores). Aside from one effort in Canada and a quietly successful platform in Germany, the idea has not had much success. And now Amazon is giving it a try. 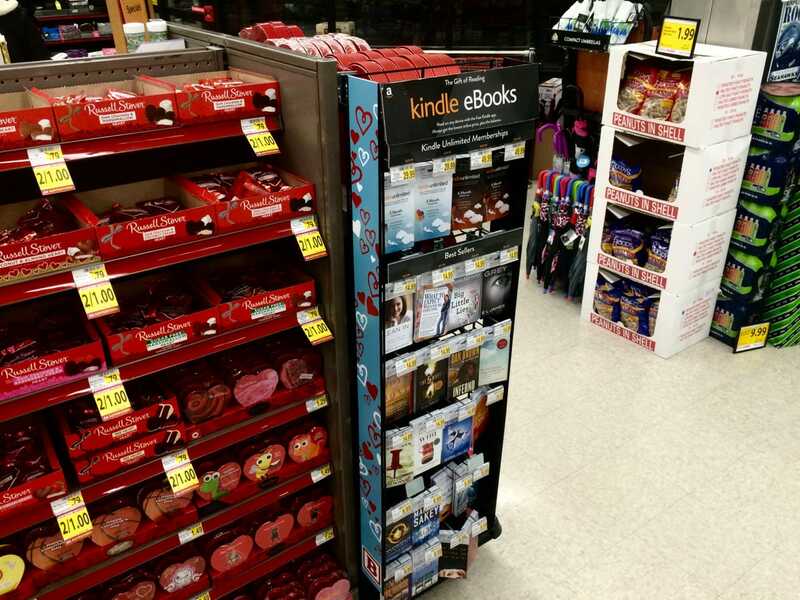 There's been no formal announcement from Amazon, but late last month the Seattle-area drug store chain Bartell Drugs revealed that it is carrying Kindle gift cards in its stores. Amazon has confirmed the news on a help page on the Amazon website, writing "Kindle Cards are Amazon.com Gift Cards that depict popular Kindle books and Kindle Unlimited subscriptions in the form of a physical card, which can be gifted to friends or family members or applied to your own account. Included on each Kindle Card is a description of the Kindle book or Kindle Unlimited subscription, and instructions for redeeming the book or subscription to the desired account once the card has been activated at the store register." 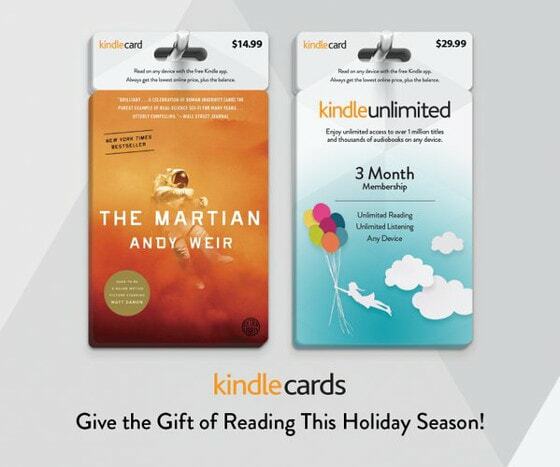 Unlike regular gift cards, Kindle Cards are tied to specific titles, but Amazon isn't going to hold you to the sale. If someone gives you a card for a book you don't want, Amazon will let you trade it in for a regular Amazon.com credit. Similarly, if the price of the ebook drops below the price listed on the card, Amazon will give you a credit for the difference (less applicable taxes, of course). You can find more information on Amazon. Update: Amazon told me that the pilot is running in 61 Bartell Drug stores, and includes 20 Kindle titles and 4 Kindle Unlimited card designs. Bartell informed me that the pilot started in October 2015, and that Amazon selected the twenty titles in the pilot based on their best-selling titles for gifting. The top row of the kiosk features cards for three- and six-month Kindle Unlimited memberships, for $29.99 and $49.99 each. Below those are cards featuring the covers of 20 individual ebooks, best-sellers across both fiction and nonfiction, ranging from “What to Expect When You’re Expecting” and Sheryl Sandberg’s “Lean In” to Dan Brown’s “Inferno” and “The Martian” by Andy Weir. On the back of each ebook card is a quote from an Amazon customer review and a summary of the book, along with an area for writing a message to the recipient and instructions for redeeming the book by scratching off the claim code and going to a dedicated Amazon url to enter it. Purchasing the card at the Bartell Drugs register automatically activates it for use, as with a standard gift card. I also know considerably more about the competition. Livrada, for example, launched a similar pilot in Target stores in 2012. That effort included only a half-dozen titles, and went nowhere. But up in Canada, Enthrill is having more luck. This Calgary-based startup launched a similar product in Canadian Safeway stores in 2012, and over the past three years they have expanded ebook gift cards into over 3000 locations in Canada, including Sears, Toys R Us, Safeway, Shoppers Drug Mart, Giant Tiger, Home Outfitters, Home Hardware, and Longos. Enthrill is also the vendor which supplies the Walmart-brand ebook gift cards in Canada and runs Walmart's ebookstore. That program launched in November 2014. I have no info on when Enthrill or Walmart plan to expand their programs into the US, but now that Amazon is interested I can guarantee that publishers and retailers will be taking notice. 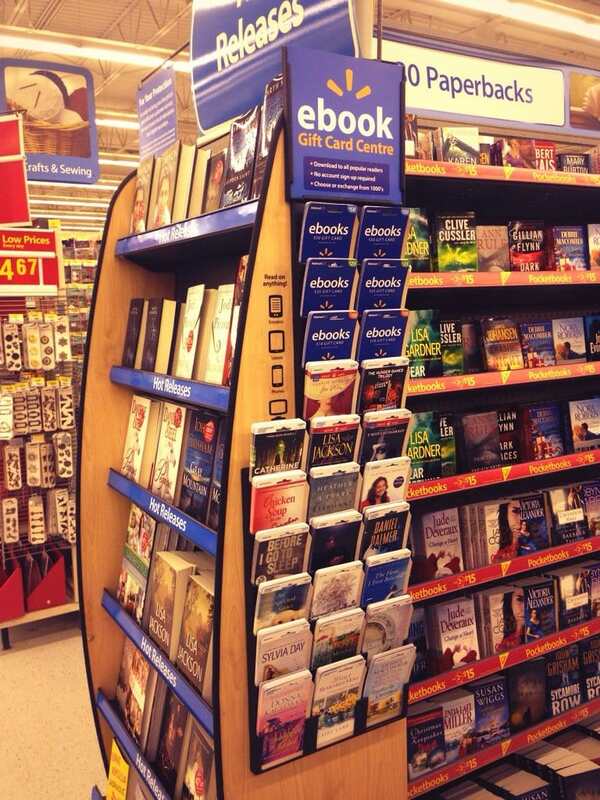 I didn’t know Walmart had an ebook store. When did they open it? In Canada? Last year. It has yet to expand to the US. Any idea what format they sell books in? They seems to list instructions for quite a selection of ereaders, including the Kindle. I didn’t think Amazon let anyone sell DRM ebooks for Kindle. They must be using digital watermark DRM. It seems easier to buy the standard gift card. If so that would be rather newsworthy. Strangely almost no one has reported on Enthrill or Walmart ebooks (which seems to be identical to Enthrill), and no one has mentioned anything about DRM. Enthrill’s website doesn’t even mention it one way or the other. Unfortunately they have a terrible selection. I guess they think “Thousands of Titles” is impressive, but I don’t. They do have a couple of popular titles (ex. The Hunger Games) though. Enthrill uses PackaDRM, a patent-pending, proprietary DRM solution that works on all devices and platforms, including Kindle devices. There is no app, ebook files are delivered into the reading environment (app, native or otherwise) that the user is already using – this way their content is not sequestered into a reading app that they don’t use regularly. Enthrill’s selection continues to grow rapidly and while not at a level that can make a claim as hundreds of thousands of titles yet, we are close. The retail ebook program developed by Enthrill has iterated several times since 2012 and has amassed some very interesting data. Because Enthrill delivers books to any device, it knows what device or app is being selected at the time of purchase/download, providing the data on who belongs to any particular platform, a great marketing tool and great market data. Thanks for the info, Kevin! I’m trying to plug the hole in selling ebooks at book events, when my table is covered with print editions. I’d like to sell per-title/format cards (like the retail cards) that contain links to special links at my ecommerce site (Gumroad) (where the ebook is free, since it’s already been paid for). This allow me to, for example, give free ebook editions to people who buy print editions, or let them buy them as gifts for someone else, or let them buy only ebook editions for themselves. I can get uniquely-numbered cards printed, but I haven’t figured out what I need to buy that ensures the links to the ecommerce site are secure (one-time use per unique card number). Have you looked at Bookshout, Enthrill, or Livrada? They all do something like what you are asking for, and I think Livrada does exactly what you want. They all seem to be defunct except for large corporate buyers. They used to have arms for small publishers circa 2013/4, but that seems to have been moth-balled in all cases.